Our Manager 360° feedback survey has been designed with first and second line managers in mind. It seeks to identify the great things they are doing with their teams and to highlight how they - as role models - are influencing the ways that other people within the organisation get results. Again, not forgetting the need to raise awareness of the competencies in which they may not be quite so strong, or where the things they do might be having a negative impact. The survey consists of 44 behavioural statements. Our 360 degree feedback surveys can be delivered via our managed service where we take care of everything for you or we can prodive you with access to our online survey system to allow you to set up and manage surveys in house depending on your requirements and resourcing.Our services is completely scalable, catering for one off 360 feedback requirements for a single individual to running surveys for large groups in a company wide initiative. Details of our administration options can be found below. 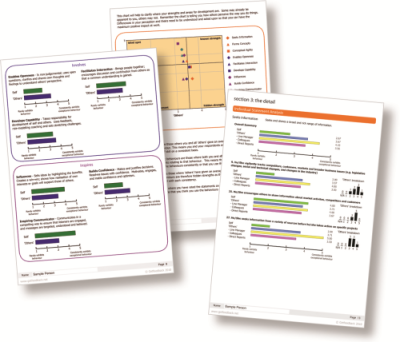 Our 360 degree feedback reports have been designed by our experienced consultants in order to ensure the individuals receiving feedback can quickly understand their results. The reports encourage the individual to consider how they can make use of their strengths and recognise where their behaviour and actions may be having a negative impact. There are also two group reports available. To find out more about our reports please visits our reports pages.